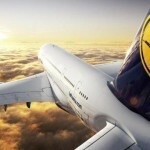 Lufthansa promo code: get €20 discount all flights from France! Swiss Air Lines high season cheap flights many European cities to Vietnam €341 or £347! Fly from many French cities to San Francisco from €264 return! German national airlines offer new way to save this time with this Lufthansa promo code you can get €20 discount on all flights from France. Enjoy great service of first European 5-star carrier . (Ranked by Skytrax) with even cheaper flights! Simply check below Lufthansa discount code and use it during booking process directly at the website of airlines. This Lufthansa promotional code is available only till end of July so hurry up and save some decent money with this Star Alliance airline. For instance (see below our booking sample) you can book very cheap return flights to Singapore already for €381 return. To apply this Lufthansa promo code you need to proceed to last step “Choose Payment Method”. Right below price breakdown at right side of your screen you will see “Get a discount on your fare”. Click on it and enter below Lufthansa promo code. Once you hit apply your next flight will be automatically discounted. As mentioned you need to to use this discount with Lufthansa by 31st of July. Travel period from 27th of July to 14th of December 2018 or 1st of January to 31st of March 2019. The value of the promotion will automatically reduce the net flight fare (excluding taxes and surcharges). This Lufthansa promotional offer is only valid for flights departing from France. Valid for bookings made directly throught the website of the airline. This latest Lufthansa promotion code 2018 can be applied to a flights where all legs are operated by Lufthansa or Lufthansa City Line. To use Lufthansa promot code 2018 or in case of to read full conditions please visit Lufthansa web site directly. 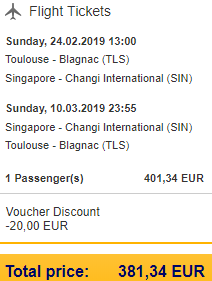 As per below booking sample you would fly from Toulouse to Singapore for just €381. (With already applied €20 Lufhansa voucher). You would depart from France to South East Asia on 24th of February 2019 and return from Singapore to France on 10th of March.